Looking for a gift for that someone special that won't break the bank. Perfect for Valentines day, Mother's Day or just simply to say 'I love you' anytime. Keep romance alive we say! We've filled a rather elegant little black heart and foiled design Pouch box with 8 pyramid bags of our Cocktail (Mocktail) Mix jelly beans. All the taste but none of the headache - absolutely no alcohol! 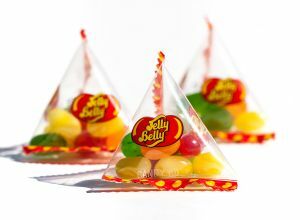 These little pyramid cutsies each hold approx 10g of Jelly Belly beans (approx 8-9 ind beans per pyramid). Are we feeling the Luuuurve yet....? E903, E904), coconut, thickener (tapioca dextrin), colours (E100, E162, E163ii, E171).